PLEASE BEWARE ITEM LOCATION IS BRAZIL NOT USA AND SO THAT SHIPPING COST OF $4.00 IS NOT CORRECT. ACTUAL SHIPPING COST ARE TOLD BELOWER ITEM DESCRIPTIONS. 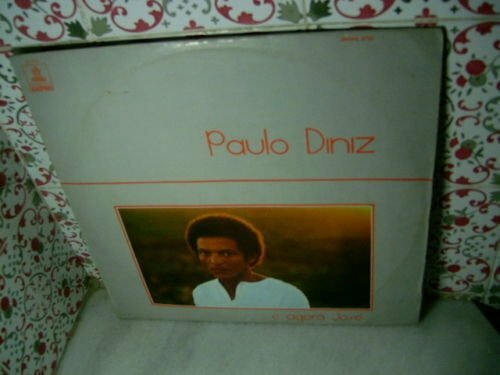 PAULO DINIZ ..E Agora Jose LP 1973 INSERT BRAZIL BLACK SOUL MUSICARTIST : PAULO DINIZ TITLE : ..E Agora JoseLABEL : ODEONLABEL NUMBER : 3726RELEASING YEAR : 1973MADE IN : BRAZILCOVER CONDITION : VG+MEDIA CONDITION : VERY GOODINSERT : YESCOMMENTS : Postage rates are based on a 1 record purchase and its shipping out by AIR MAIL. Delivery Time is 10 to 18 days. Rates are as following: U.S.A. = US$ 17.00 ( Additional 1LP = US$ 5.00 up to 5kg) EUROPE = US$18.00 ( Additional 1LP = US$ 6.00 up to 5kg) ASIA = 20.00 ( Additional 1LP = US$ 7.00 up to 5kg ) GRADE STANDARTS ARE BASED AS FOLLOWING: MINT The record itself is in brand new condition with no surface marks or deterioration in sound quality. The cover and any extra items such as the lyric sheet, booklet or poster are in perfect condition. Records advertised as Sealed or Unplayed should be Mint. EXCELLENT The record shows some signs of having been played, but there is very little lessening in sound quality. The cover and packaging might have slight wear and/or creasing. VERY GOOD The record has obviously been played many times, but displays no major deterioration in sound quality, despite noticeable surface marks and the occasional light scratch. Normal wear and tear on the cover or extra items, without any major defects, is acceptable. GOOD The record has been played so much that the sound quality has noticeably deteriorated, perhaps with some distortion and mild scratches. The cover and contents suffer from folding, scuffing of edges, spine splits, discoloration, etc.FAIR The record is still just playable but has not been cared for properly and displays considerable surface noise; it may even jump. The cover and contents will be torn, stained and/or defaced. POOR The record will not play properly due to scratches, bad surface noise, etc. The cover and contents will be badly damaged or partly missing. BAD The record is unplayable or might even be broken, and is only of use as a collection-filler. Powered by eCRATER . List your items fast and easy and manage your active items.